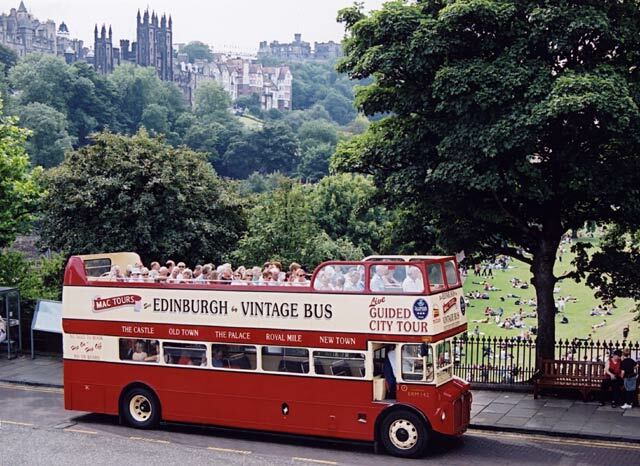 Here is an open-top tour bus, an ex-London Transport Routemaster, with a full load of passengers on the upper deck. The photograph was taken at Waverley Bridge in April 2003. - Edinburgh Castle (mostly hidden behind the large tree). There are a surprising number of people sunbathing in East Princes Street Garden, considering that the photograph was taken in April.